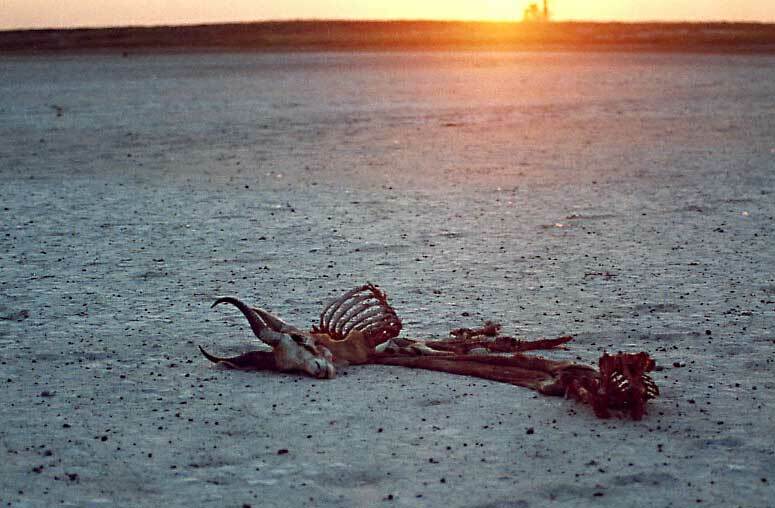 Caption: Skeleton of a springbok is illuminated by the setting sun in the desolate Makgadigadi Pans, Botswana. Photo: © Scotch Macaskill. Location: The Makgadikgadi Pans in Botswana are flat, featureless salt and clay depressions interspersed with sand dunes, islands of vegetation, grass plains and patches of Kalahari Desert. The pans cover thousands of square miles and are visible from space. Periodic rains cover them with shallow waters, attracting flamingoes and, as the waters disperse, migrating herds of zebra and wildebeest plus other large and small mammals, including lion, buffalo, elephant and a variety of antelope.